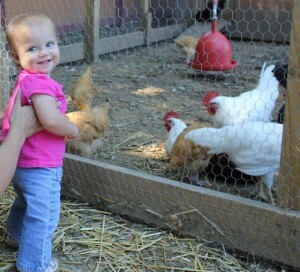 Annie’s Animal Barns at Parlee Farms in Tyngsboro, MA (near Lowell) are a must see for children and adults. 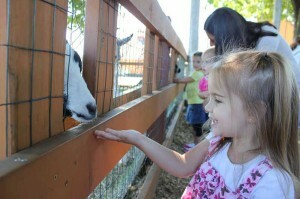 We have over 90 young farm animals to feed and pet – baby goats, sheep, chickens, and bunnies. The goats and sheep eat right out of your hand, while the bunnies and chickens run to the trough when feed is put down the feeding tube! Our main attraction is “Annie’s Goats in the Trees”. It is a fabulous goat walk where you can send goat food to the top platform to feed the goats way up near the trees! When you are done feeding the animals, we have handwashing stations with running water and soap to help keep those little fingers clean! We work very hard to keep our barnyard animals healthy. They are seen regularly by a Veterinarian and we keep them on a strict diet. If you would like to feed the animals, food is available in feeding machines at Annie’s Animal Barns. Please do not bring food from home or from other farms to feed our animals. We monitor what and how much they eat. Please work with us to keep our farm animals healthy so all our visitors can enjoy them as much as we do!